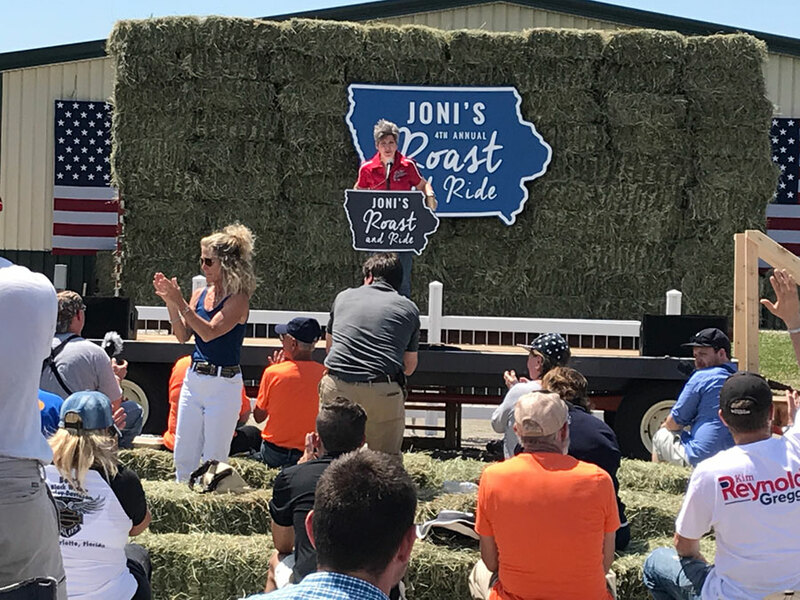 Senator Ernst talks to the Roast and Ride crowd. 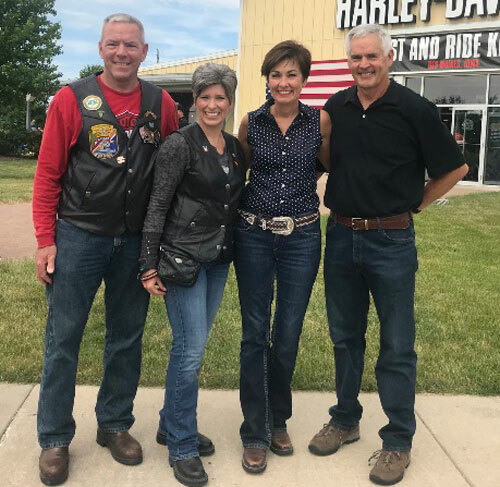 Republican Senator Joni Ernst is joining her friend and political ally Kim Reynolds in questioning whether weathly businessman Fred Hubbell — the Democratic nominee for governor — has the proper kind of Iowa roots. 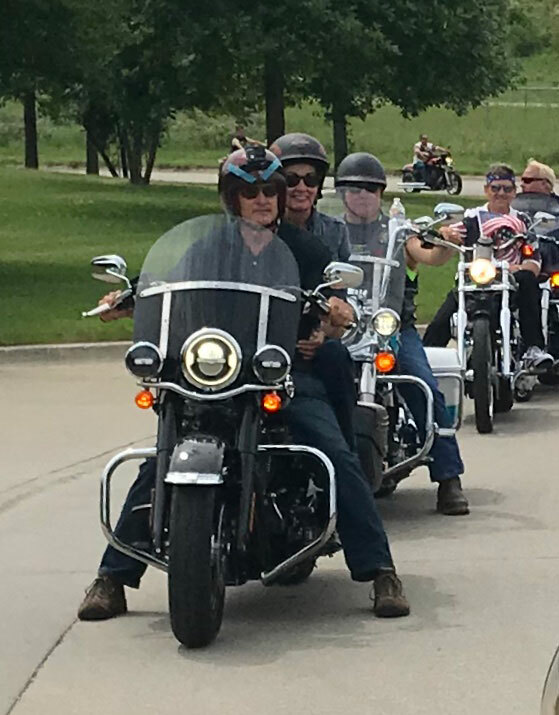 Ernst’s fourth-annual “Roast and Ride” fundraiser attracted about a thousand people in Boone Saturday afternoon. 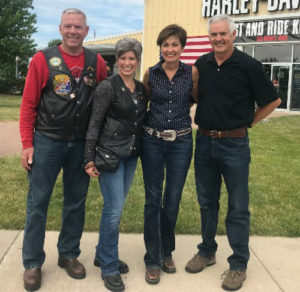 Ernst led a long line of motorcycles on a 49-mile ride to the event, with Governor Reynolds alongside, riding on the backseat of her husband’s motorcycle. 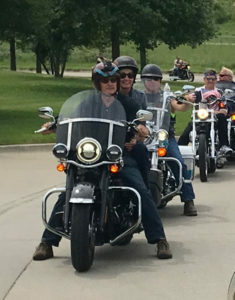 Governor Kim Reynolds and her husband on the ride. During a debate in late May, Hubbell said voters are “dissatisfied” with the status quo and he disagreed with a recent magazine analysis which ranked Iowa as number one among the states in terms of infrastructure, health care and education. Reynolds mentioned Hubbell’s remarks during her speech at the Ernst fundraiser. “Well, Fred, if you don’t think Iowa’s the best place to live, then you just don’t know Iowa,” Reynolds said Saturday, to cheers. And Reynolds again suggested Hubbell, as part of a prominent Des Moines family, is unable to relate to ordinary Iowans. The Hubbell’s family fortune dates back to the mid-1850s, from investments in real estate, railroads and the founding of a Des Moines-based insurance company. Fred Hubbell has contributed $3 million of his own money to his campaign so far and he’s offered this response to Reynolds’ criticism. “She can attack me all she wants. My wife and I have had a lot tougher experiences than that and so that doesn’t bother me a bit,” Hubbell said on Iowa Public Television this weekend. That’s a reference to the couple’s experience as hostages to airplane hijackers back in 1981. Hubbell touts his experience in corporate boardrooms as an asset. Hubbell pointed to last fall’s withdrawal from the state’s cash reserves to balance last year’s budget and the mid-year cuts to this year’s state budget.